The IT Service Assistant is different from a traditional IT help desk because it is proactive rather than reactive. Standard help desk solutions simply await a user complaint, which must be submitted as a formulaic support ticket. From there, it's up to a human to triage that ticket and—more often than not—fire back a boilerplate response. The same problems turn up again and again, and neither individual users nor the userbase as a whole can seem to learn from these repeated mistakes. The modern IT service desk is different because it intercepts problems before a ticket is even filed and suggests solutions on its own. It has both the web dashboard an admin would expect and an A.I.-powered assistant that sits right in chat platforms like Slack, Microsoft Teams and HipChat. So, it has access to the questions and complaints posted to open channels or in direct messages to bot, from your employees. From there, the modern A.I. technology analyzes the content of the question, converts it to candidate support tickets, and suggests a list of standard responses for each ticket. Instead of waiting for someone to open up a new system and file a support ticket (or having to convert an unhelpful string of emails or voicemails into a support ticket), the Service Assistant does this for you. Now, all a support tech has to do is review a self-populating list of help requests to determine which are actual problems that need solving, and which are just idle complaints. The A.I. software behind the service desk doesn't just analyze the problems, it also analyzes the typical solutions. Now you don't have to keep manually sharing support links that have been posted a thousand times before. The service desk connects common questions with common answers and serves up a suggested list of standard responses for each auto-created support ticket. With just a few clicks you can accept a support ticket and post a solution without ever losing your cool. And these responses don't have to be mere links. 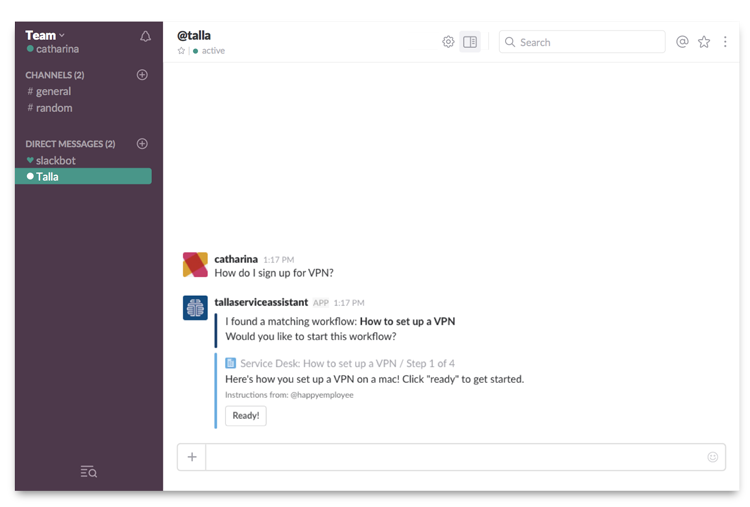 For instance, Talla's IT Service Desk supports full interactive messaging campaigns within Slack, so the service desk can do more than just suggest a series of corrective steps—it follows up, solicits feedback, and monitors progress. The service desk gets tech support out of the nagging game and holds users accountable for following best practices. In other words, the IT Service Assistant can make sure that users read the f-ing manual. The IT Service Assistant and the A.I. behind it aren't going to replace support engineers, but they can remove the rote, repetitive aspects of working tech support. Your IT staff can now focus their attention on truly unique and complex problems that are most worthy of their time and attention. 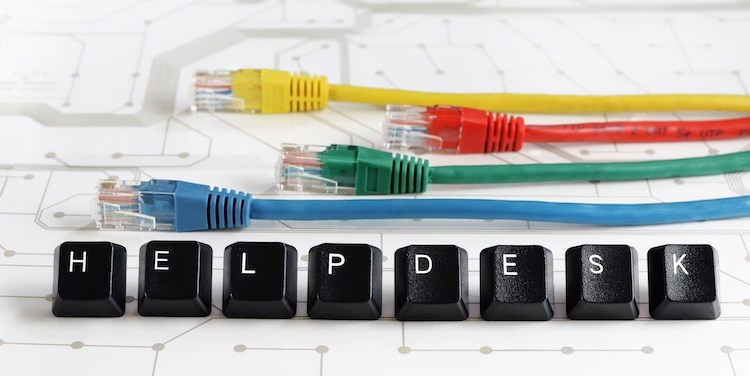 After all, isn't it time that technology made the IT department's job easier for once?